McLaren's choice cut // If one man has to go, who should it be? The 2015 driver market is in full swing now, and one of the teams in the centre of what is affectionately known as ‘silly season’ is McLaren. Although very much a midfield marque this season, the team have plenty of potential going for them for the future. A new Honda engine, the return of Ron Dennis at the helm, and the distinct possibility of a driver shake-up. Outside the team, speculation veers from the return of Lewis Hamilton from Mercedes, to Alonso revisiting his acrimonious past via the more unusual means of a deal with Honda. Button has appeared increasingly glum over the past few race weekends, stating his aim is to remain in Formula One but equally understanding that his future is pretty much out of his hands at this point. The question is, if McLaren do opt to bring in one or more new drivers, would they retain Button or Magnussen, two very contrasting options? Button’s future rests in the hands of Ron Dennis, who had already retired when the Brit was brought over from championship winning team Brawn GP. There’s been some tense times between the two after Dennis’ return to the helm of McLaren this year, but ultimately they seem to have a professional relationship that stands up to the pressures racing brings. Jenson has arguably the most experience of F1 than anyone on the grid, and he brings with it a level-headed competence to navigating a racing season. Rarely involved in incidents, Button knows when to push hard and when to hold back. He’s taken a championship for himself in 2009, so can put together a campaign when required, but perhaps he doesn’t have the feisty raw hunger at this point that someone like Alonso still so clearly displays. It’s an old joke by now that Button is never satisfied with the car beneath him. If it’s not oversteer, it’s understeer, and if it’s not one or the other, it’s both. That could speak volumes of a driver knowing how to push the car, how to feed back to the mechanics in the garage, and how to extract what he wants from the machinery given to him. Or it could be a crotchety driver who is a little set in his ways hoping the team can adapt to him rather than the other way round. I don’t know which it is. Button’s worked hard at getting his life in order. The sad death of his father took its toll, but he has the support of a long-time girlfriend, trainer and more to keep him going. It’s just hard to know if there’s enough aggression left to seek another championship, or if it is time to step back and let someone else have a go. McLaren have run a policy over the past few seasons to partner an experienced driver (Button) with an up and coming racer. Previously, Sergio Pérez was given a brief but curtailed shot at driving for the team, eventually being booted for Kevin Magnussen. Although benefitting from a famous father, Kevin has more than proved his own in the McLaren seat, getting far more out of it than Sergio ever did. Magnussen appears a quiet, determined character but has gradually been coming out of his shell. The BBC featured a great piece on him during the Russian Grand Prix weekend, showing how he deals with fame in his home country of Denmark. Firstly, who knew he was that famous? And secondly, he deals with it very well. 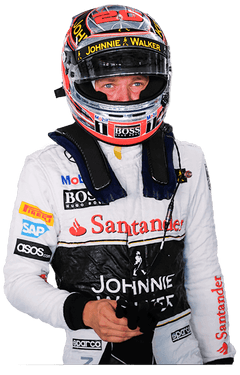 Displaying the same level-headedness as his teammate, Magnussen always appears the consummate professional and is rarely ruffled. He’s also let slip the occasional technical phrase that shows his character on the McLaren Tooned animation as a slightly boffin-like, nerdy driver was not entirely without merit. What there appears to be on Magnussen’s side of the garage, however, is the exuberance and resolve that only comes with youth. The occasional incidents this year can be put down as learning experiences for the purposes of this article. Pastor Maldonado and Romain Grosjean set a new benchmark in rookie errors, and Magnussen has steered well clear of following in their footsteps. He's already made his mark in F1, but needs to attract and keep the focus of the big teams now to avoid getting stuck in the midfield like Nico Hülkenberg before him. If I were in charge of McLaren, I would first of all find out where Martin Whitmarsh has gone and make sure he’s alright. But then, I’d settle onto a sofa and think about which of these drivers would be the one to retain, if that decision becomes necessary. On balance, I’d have to go with Kevin Magnussen. Youth doesn’t always outweigh experience, in fact many times it absolutely doesn’t. But in this case, Magnussen seems to have an old head on those young shoulders, and a bright future ahead of him. He fits the current McLaren brand – crisp, clean, smart and likeable. Thursday Thoughts - Who should be the next boss of FOTA? How do you give a small penalty?